Was Mars’ ancient magnetic field global or localized? Mars is a sweet place to drive rovers. It’s also an awesome laboratory for large-scale planetary processes. Both Earth and Mars, for instance, have rocky mantles and iron-rich cores. Today, vigorous fluid motions in Earth’s outer core produce our global magnetic field—we know this “dynamo” has operated for >3 billion years. Mars, in contrast, has no dynamo now. But parts of the Martian crust are strongly magnetized, suggesting that Mars had a magnetic field at some point in the past. Did Mars’ ancient magnetic field encompass the entire planet? A global magnetic field could’ve helped Mars hold onto its early atmosphere (interactions with charged particles in the solar wind can cause atmospheric escape) and kept harmful ions from bombarding any critters eking out an existence on the surface. This paper uses computer simulations to attempt to explain the curious observation that strong crustal magnetization predominantly occurs in the southern hemisphere. A previous paper suggested that dynamo action, and thus Mars’ magnetic field, may have been confined to the southern hemisphere. This paper, in contrast, argues that such a dynamo would exhibit too much temporal variability to produce strong crustal magnetization. Dietrich and Wicht conclude that a global magnetic field, albeit short-lived, was required. They invoke post-dynamo processes like impacts to erase magnetization in the northern crust. Figure 1 (Dietrich and Wicht 2013): Simulations results for a dynamo localized in the southern hemisphere. Visualization of fluid flow halfway down the core (top) and the radial component of the magnetic field at the core/mantle boundary (bottom). Note the magnetic field (all the colors) is concentrated in the southern hemisphere. Red/yellow indicate outward flow, whereas blue means inward. Simulations succeed in producing a localized magnetic field, but fail to produce a steady magnetic field. How are crustal rocks magnetized? Glossing over many details, I’ll just say that many rocks (especially igneous ones that comprise a large portion of Mars’ crust and Earth’s seafloor) preserve a remnant magnetism that records the orientation of the ambient magnetic field when and where they formed. Earth’s magnetic field is roughly a dipole; it’s inclination varies as a function of latitude. Moreover, the orientation of Earth’s dynamo reverses every so often. In the 1950s and 60s, scientists used these facts to develop the theory of plate tectonics—arguably the great scientific revolution of the late 20th century. Physics works the same on Earth and Mars. The remnant magnetism of Martian rocks might tell us a lot about the history of Mars’ magnetic fields. In particular, the magnetization of crust in the southern hemisphere is very strong, indicating that many of the rocks have magnetic minerals aligned in the same direction. Because rocks form slowly, this could mean the magnetic field kept roughly the same orientation for millions of years. Can Mars maintain a steady magnetic field in only the southern hemisphere? According to these authors, no, but let’s elaborate. In this paper, Dietrich and Wicht simulated a dynamo that primarily produced a surface magnetic field in the southern hemisphere. To achieve this, they imposed a higher heat flow from the southern half of the core (higher heat equals more vigorous convection). The dramatic hemispheric dichotomy—the northern crust is young and thin compared to the crust in the southern hemisphere—may indeed break spherical symmetry inside Mars in this fashion. Figure 1 shows the radial flow of material halfway down the core and the radial component of the resulting magnetic field at the core/mantle boundary. Here, red means outward and blue means inward. Looks great, as a snapshot. The problem is that the direction of the magnetic field oscillates rapidly (by which I mean over only a few hundred thousand years). Figure 2 shows the time evolution of the Gauss coefficients, which represent the strength and direction of the different spherical harmonics that comprise the magnetic field. Red, green, blue, pink, and light blue curves represent the 1st through 5th degree harmonics, respectively. An oscillating magnetic field would not produce remnant magnetization that is as strong as observed. Therefore, perhaps ancient Mars did indeed host a global magnetic field (a plus for habitability), but the giant impact that created the hemispherical dichotomy, or some other process, erased the remnant magnetization of the northern crust. Geophysicists might quibble about the details of these simulations and the timing of any giant impact events. This paper, however, certainly demonstrates the importance of focusing on the temporal evolution of dynamo models. All in all, people are working hard to unravel the veil of mystery that covers the history of early Mars. Figure 2 (Dietrich and Wicht 2013): Evolution of the first five Gauss coefficients (related directly to the spherical harmonics of the magnetic field) over a period of non-dimensional time corresponding to roughly a few million years for two simulations. The parameter g represents the extent to which heat is preferentially extracted from the southern hemisphere of the core. 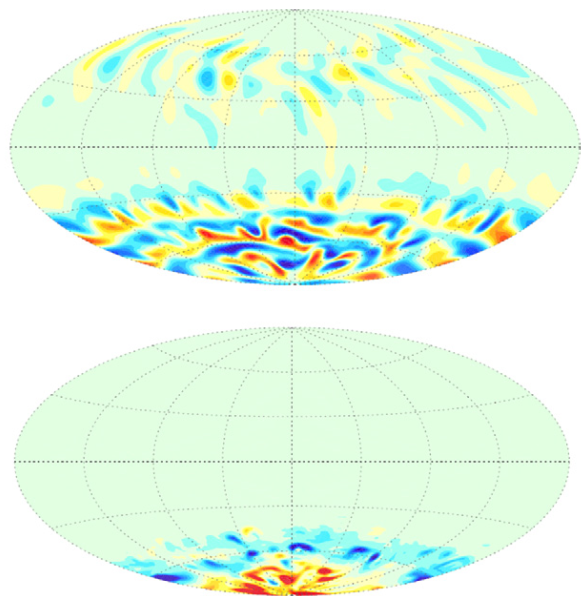 In these two simulations, g is high enough for the magnetic field to be concentrated in the southern hemisphere, but this rapid oscillatory behavior is unlikely to produce the high levels of remnant magnetization observed in the southern hemisphere. Using observations from home to improve the transit method Are Extrasolar Worlds More Likely to Be Water-rich? Falling stones paint it black Could we detect Europa-quakes? The term should be Dynamo Effect…not just Dynamo. I notice that the northern hemisphere, the image shows N-S orientation, “Striated”, while in the southern hemisphere the magnetization is in concentric circles…like a target. I think, regardless of the case, that the Dynamo Effect was more concentrated in the south, and was less in the north. And the simulation image at least, shows a tendency to go towards the south, where it is “strongest”. It would appear. So maybe it was global, but just weaker effect in the north, as well as any “Magnetic Erosion” factors.